If this is what your not-so-good version looks like, I can't wait to see the good one! This looks so oishii yo. 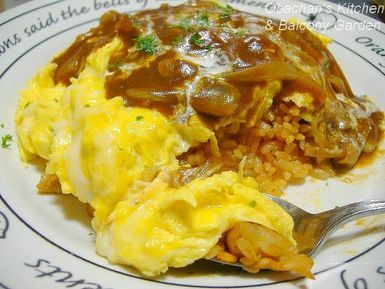 I love ketchup rice too...especially in omurice and doria. I'd never even heard of this dish 'til you posted about it. Why do you suppose some hate it while others love it? We have something similar here called Pattaya Rice (fried rice wrapped in omelette). It's a Thai dish, hence the name. Unfortunately, most of the demiglace that they sell in supermarkets has an overly strong flavor. For meals with a delicate blending of flavors (like omu-raisu), it can be a bit overpowering. Ah, doria! Yep, I love it, too! Visit this thread and see why some people hate this stuff so much. Yeah, I’ve heard about it. I guess someone mentioned about the thai dish in the above mentioned thread, too. Does Pattaya Rice have ketchup rice inside? I agree. Next time I’m going to do something about it. The izakaya I used to work at made demi glace sauce from scratch, and they poured both their demi glace and store-bought ketchup on the omuraisu they served. It was quite good. You know what? Now we can watch the re-run of Lunch Queen here in Kochi on weekdays. Omuraisu they make does look good. I wish I can make one like that. BTW, have you been to Kinokuniya bookstore recently? Is this book already available there? I tried to order one via Amazon a couple of days ago, then they gave me an estimated ship date of sometime in November!! But someone already wrote a book review on Amazon website on July 10, and today Amazon is giving me the estimated ship date of 7/15/2006. So I’m wondering if they are in store now over there in Osaka. The book is available from Amazon Japan now, the November shipping date was for the US, the sales people at the publisher are not able to do real work like getting the proper info to Amazon, so I'm afraid to ask them if it is in the Osaka kinokuniya. Anyway you can be sure it is available from Amazon now. Sorry I haven't been able to find my text copy of the carnitas tacos recipe, maybe I can scan it from the newspaper. As for omrice I always make it with catsup flavored chicken rice with piman and onions. I pass on the demi sauce and decorate the top with catsup. do you think the chicken rice sounds like "too much?" It takes more than six hours to make demi from scratch and the Japanese yoshoku demi is a strange creation that exists only in Japan, and (as you know) when made in a restaurant is quite different from the Heinz canned stuff. So funny! That sounds like exactly the sort of thing a Canadian would eat. Did you know that we have ketchup-flavoured potato chips, which are apparently hard to get in the U.S.? Obachan, ketchup/chilli sauce is poured on top of pattaya rice, not inside. Thanks for your help. :D I managed to order the book last night and can’t wait to see what’s inside. Honestly I fell in love with it just seeing its front cover. It’s not the same old ”photo of a kaiseki dish with Japanese traditional patterns in the background” kind of design. Such a good taste. Oh, don’t worry about the tacos recipe. And as for omuraice, sorry I didn’t make it clear… I did make mine with chicken rice, I mean, Japanese chicken rice. In fact, I never make omuraisu without chicken and onion – these are the must-have ingredients for me. I tried to avoid using the word “chicken rice” because I heard that our chicken rice is different from what they have in Southeast Asian countries, so I thought the name might be misleading. Theirs is not fried and not seasoned with ketchup, right? But I guess just saying “ketchup-flavored fried rice” was equally misleading, because people would think that ketchup and rice are the only ingredients used. Maybe that’s part of the reason why some people think omuraise is yucky without actually tasting it. Guess what? We have ketchup-flavored potato chips here in Japan, too (launched March 2006). I wonder how it would be like … well, I should know. It would taste like potato chips with ketchup, of course, but … you know what I mean?